Attackedastoria Nails: Killjoys, make some noise! Since I'm absolutely in love with My Chemical Romance's new album Danger Days, I decided to do some nails inspired by it. Most of it is taken from aspects of Party Poison's costume. I like how the Dead Pegasus turned out, the rest is okay. I was feeling kinda crampy, so I rushed it. Either way, still pretty cool. Sally Hansen, Blue Me Away! I was messing around, and ended up putting two coats of Sinful's All About You over two coats of Nicole by OPI's Loyalty to Royalty. I thought it looked neat. That's it for me. Hope everyone had a nice holiday! I love All About You. I layer it over Sinful Colors Midnight Blue, and recently I tried it over white. So cute. It looks good over so many colors, doesn't it? I layered it over Zoya's Cheryl recently, which is a chocolately color, and it looks amazing. omg! do you do tutorials? 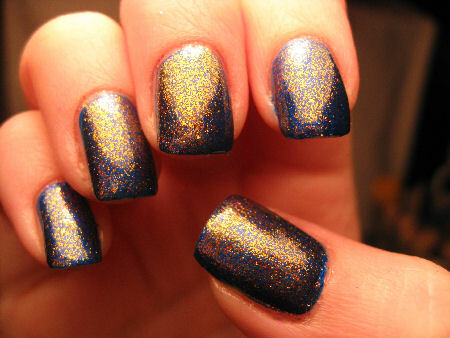 I sooooo need my nails done like that. I haven't done any tutorials yet, but I may in the future! These nails were pretty simple to do. I looove that last mani! It's amazing! I love the killjoy nails. I can't even put on one layer of nail polish good, though. 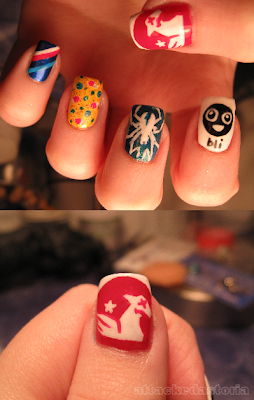 OMG, the killjoy nail are AWESOME!! You have a great taste in music and an awesome talent. LUCKY!! killjoys nails are awesomee! i love them! you've got to make tutorial !! I love the MCR nails! wish i could paint my own like that! awesome! can you make a video for the second nails?